The first Moto Guzzi I saw was in 1967 at a hill climb in Holt, Missouri. Aboard our 1965 750 Norton Atlas we had ridden from Topeka, Kansas with a local motorcycle club to watch our first and only hill climb. As Mary Jo and I walked across an open field with various motorcycles everywhere, I saw a beautiful red and gray motorcycle that calmly puttered by - it was a 1967 V-700 Moto Guzzi. I knew immediately what it was because I had seen ads in the motorcycle magazines of the day. I was interested in the Guzzi for various reasons. The most important one for me at the time was it's unusual looks, especially the engine layout. At about that same time I was wishing to trade the Norton off on a R-69S BMW. Several friends we rode with owned BMWs, from the R-26 250 single to the mighty R-69S, and I was indeed fond of these motorcycles. 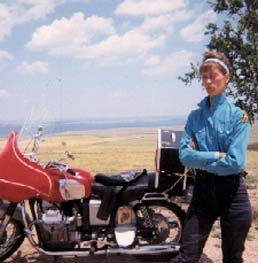 A few months after attending the hill climb, and still riding the Norton, the company I worked for transferred me to Hays, Kansas, about 200 miles west of Topeka. This transfer changed our lives from that point in time right on up to the present day. I met Uncle Kitch (as his loyal customers called him). Don Kitchen owned and operated a Berliner shop. Mike Berliner, in those days, imported Ducati, Norton, and Moto Guzzi - the Berliner Corp. Don changed my life forever! REALLY true! It wasn't long after moving to the flatlands of western Kansas that I was hooked on Guzzi. A local rider was kinda famous in the area for his hard, long and fast rides on his 1967 V-700 Guzzi. Talking with this rider made me a believer in Guzzi, and Don was ready to make me an owner. Mary Jo and I were poor, but Don kindly took my Norton in on trade. On April of 1968 Don wheeled the 700cc Moto Guzzi out of the shop's door (an ex gas station) and told me to take it home and pay when I could. As he pushed the V-700 out the door, he told me, "The Norton is faster, but the Guzzi will get you there quicker." Now I had a "touring machine", and Mary Jo and I had our hearts set on doing a bit of touring. 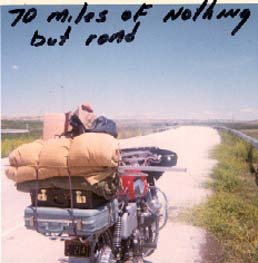 I'd never heavily packed a motorcycle down before, except for 200 mile jaunts on the snorten' Norton. 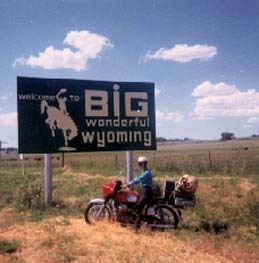 But we were headed for Yellowstone National Park, in style, on a brand new Moto Guzzi. Don ordered a Wixom handlebar fairing to match the red Guzzi tank, and I found a generic luggage rack at the local Honda shop that worked. We rented a huge and extremely heavy tent made from thick canvas. We also rented a huge sleeping bag, and packed those on the bike along with pots and pans, some food and a few pieces of clothing. If you'll look at the picture of Mary Jo standing in front of the V-700 you can see the box covers half of the passenger's seat. We sat close together on this ride. Neither one of us would go for such an uncomfortable sitting position today. Whatever worked was the theme then. In those days we didn't know any better. As long as we were going we were happy. That first trip of 1800 plus miles was probably the best or one of the best trips we've ever taken. In those days I was willing to smell the flowers, and using my cheap Instantmatic camera I took lots of photos. Not very good ones at times, but lots of them. We left Hays on a July morning in 1968. Our first night's stop was in the Torrington, Wyoming city park just across the border from western Nebraska. These days you couldn't pay me enough to camp out in a city park with no showers and prepare our meals. But we were feeling free and happy. Not only was this our first motorcycle trip but our first vacation, so this was a nice experience for us. We arrived at the city park in late afternoon. I set up the 9x9 umbrella tent. Stuff was sprawled between the heavy duty tent and the Guzzi. Mary Jo was getting ready to prepare our supper when a neighbor who was also travelling (with his family) stopped to look our campsite over. He was amazed when Mary Jo told him all this stuff did indeed come off that motorcycle. He inquired as to when we were going to pack up. He wanted to see if all those things would actually fit on the bike. That first day was 415 miles approximately. 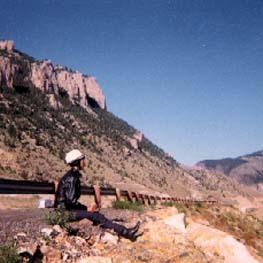 The second day we rode close to 400 miles to Cody, Wyoming. On this second night we also camped. At least that's what Mary Jo told me. I don't remember that night. I remember checking out the William Cody Museum, before heading off for Yellowstone, which we enjoyed. I'm told there's no comparison in those days to the traffic in Yellowstone today, but I was disappointed there were so many slow moving RVs. We filled the V-700 up at a gas station not far (in those days) from Old Faithful. I still remember the price because it was such an unusual amount. 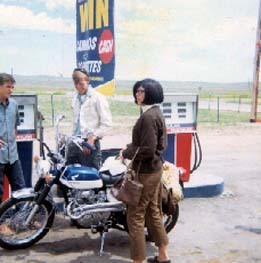 Ethel, as premium was called in 1968, was 47.7 cents per gallon there in the park, high for 1968. Ethel back home in Kansas was less than 30 cents per gallon. A fellow sightseer had also filled his RV up with fuel and was complaining to the station attendant of the large amount of people there in the Park. He told the young guy he had only been there one week but was leaving that day. I told the RV driver, "We've just arrived, and we're heading back out as soon as I pay for the gas. We wanted to have a vacation to get away from people, not go where everyone was." So we made the big loop. We went into the Park from the east entrance and went right out the same way and back to Cody, where we splurged and got a motel room for the night. That day's ride consisted of approximately 200 miles. The Park was fun, however. During those days you could see lots of black bears. We saw more than a dozen during our short time there. One of the more exciting moments came when we saw a bunch of people in a shallow ditch. Being young and dumb I pulled the Guzzi right into the bottom of this shallow ditch. The people were mostly watching a mama bear and taking pictures of her and her two cubs. I kept the lightweight Instantmatic camera on a strap around my neck. So as soon as the bike came to a stop I was already aiming the camera at the mama bear. As I was about to take the picture she started to chase a man down the ditch (thankfully in the direction away from us). I wasn't so dumb not to know this wasn't good, so Mary Jo and I hopped off the Guzzi and quickly pulled it backwards and up onto the pavement. By this time mama was headed back from where she had been (which was towards where we were parked in this shallow ditch) we both were on the Guzzi and had a camper vehicle between her and us. After the trip was over and the film developed, I was surprised to see - not only did the picture catch the bear chasing the man, but it showed dust in the air, and one little cub going up a tree and the other cub running away. I would print the photo here, but everything is so tiny it's difficult to see and not worth the space for this particular picture. From Cody we wandered around and eventually ended up in Laramie, Wyoming. We stopped at a small motorcycle shop and I bought enough oil to do an oil change for my precious red/gray V-700. Then we visited Fort Laramie which we both enjoyed. We wouldn't have time to do that today - have places to go and people to see. If it can't be seen from the saddle of my motorcycle then we probably won't see it. We met some friendly people during our first long ride. We rode with a couple on their 350cc Honda scrambler. The wind was blowing hard that day, and the small Honda had a small gas tank and was using a lot more fuel than the Guzzi, which had a much larger size tank. So we had to stop often for the little scrambler to fill up. It didn't matter, we were having so much fun we could care less. For a while in Yellowstone Park we rode with a guy on his new 500cc Triumph Daytona. What a pretty bike it was. Funny in a way, that we met these friendly strangers and enjoyed the road with them, but never saw them afterwards. It's nice to be able to look through those old photos. I literally have wheelbarrow loads of photos. I have them stored here and there in cardboard boxes. The only time I ever look through most of the older ones is when I'm trying to find photos for a story or to send to a member so he or she can see what a bike or accessory looked like long ago. In all, that first tour on our first Guzzi ended up being approximately 1800 miles. We were gone five days and four nights. It seemed longer at the time, and now it seems like it was very short. Those were wonderful times, and very simple compared to today's tours, hurry to get there and hurry to leave style of travel. Also, in those days very few motorcyclists had a clue what a Guzzi was. At least these days, some motorcyclists have heard or seen a Guzzi. Today, we're special, but 32 years ago Guzzi was extremely rare, and I like that! We arrived home late at night. The very next day we unloaded all the gear. Then we jumped on the V-700 and headed for Topeka 200 miles away. There we picked up our five year old daughter. Grandma had babysat Debra during our trip to Yellowstone. There was room to fit Debra between Mary Jo and me. Then we rode 3-up back home to Hays, 400 miles that day. In 1969, when Debra was six years old, we rode to New Hampshire and back 3-up, but that's another story. Don dropped his dealership around 1983. In the 16 or so years I had known Don 'til that time, he sold me various used bikes and quite a few new Guzzis. Today, Don still works on my Guzzis from time to time, threatening me and saying, "I could have killed you for doing something so stupid!" He still likes me a lot!